KUALA LUMPUR, 11 Oct 2013 – The year 2012 was the warmest year on record and there is no doubt that the world’s climate is warming, as do the atmosphere and the oceans. The Intergovernmental Panel On Climate Change (IPCC) stressed that sea levels have also been rising faster in the last 110 years compared to the previous thousand years. Prof Fredolin is the first Malaysian elected to the IPCC post. 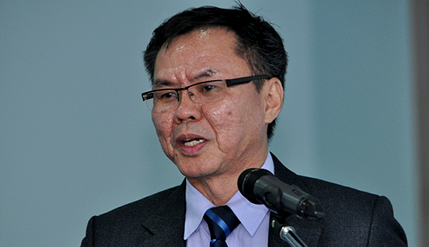 He is also a Fellow of the Academy of Science Malaysia (ASM). Speaking at a lecture and forum organised by the ASM and the British High Commission here today, he said by the end of the century the global temprature would have risen to between 2 to 5 degrees celsius if we don’t do anything about it now. He said human influence on the climate system is very clear, stating that limiting climate change requires reduction of carbon emissions and greenhouse gases. The rate of sea level rise since the mid-19th century has been higher than the previous two thousand years. Over the period 1901–2010, global average sea level rose by 0.19m. He said that there is no doubt that the climate system has been warming since the 1950s, with many of the observed changes never seen decades before. The report said the last three decades have been much warmer than the previous ones. It is virtually certain that the upper ocean warmed from 1971 to 2010 and it likely warmed between the 1870s and 1971. Over the last two decades, the Greenland and Antarctic ice sheets have been melting at an unprecedented speed. The amounts of snow and ice have diminished, sea level has risen, and the concentrations of greenhouse gases have increased. The oceans are becoming more acidic due to increasing carbon emissions. Global sea level will continue to rise during the 21st century. The ASM forum was moderated by its Chief Executive Officer, Dr Ahmad Ibrahim. Also present were ASM fellow, Prof Low Pak Sum, Dr Gary Theseira a researcher from the Ministry of Natural Resources and Environment and Political Counsellor to the British High Commissioner Nigel Bond. Prof Fredolin took part in the working group session that produce the IPCC report held from 23 to 26 September 2013 in Stockholm, Sweden.